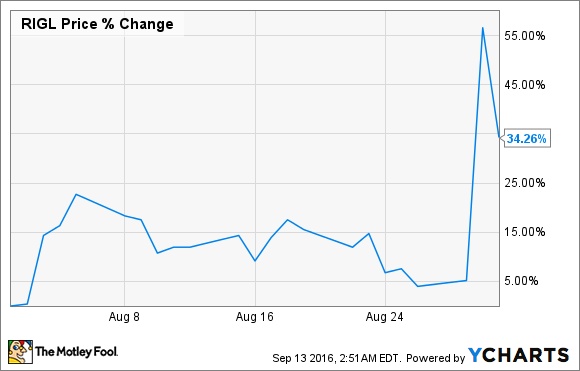 Rigel surprised the market in August with a positive late-stage data readout. Shares of the clinical-stage biotech Rigel Pharmaceuticals (NASDAQ:RIGL) gained more than 34% in the month of August, according to S&P Global Market Intelligence. The company's stock exploded higher on the next to last day in August on the announcement that its oral spleen tyrosine kinase (SYK) inhibitor, fostamatinib, hit the mark in the first of two late-stage studies assessing its efficacy against the bleeding disorder known as adult chronic/persistent immune thrombocytopenia (ITP). Specifically, the company reported that patients treated with fostamatinib exhibited a statistically significant stabilization in blood platelet levels, compared to those receiving a placebo (p=0.0261). What this means is that fostamatinib should improve an ITP patient's ability to form blood clots and avoid potentially life-threatening bouts of severe bleeding. The Street has fostamatinib's peak sales currently pegged at around $360 million as a standard treatment for ITP. If that line holds, Rigel's stock would seem to be severely undervalued right now in light of its rather meager market cap of less than $330 million. After all, it's not uncommon for clinical-stage biotechs to trade somewhere around 3-5 times the peak sales potential of their lead product candidates. Rigel expects to unveil the results from fostamatinib's second late-stage trial in either October or November of this year. If this trial reports similar results, the company plans on filing for fostamatinib's regulatory approval with the U.S. Food and Drug Administration in the first quarter of 2017. Before investors get too excited, however, it's important to understand why the market hasn't built in much of a premium (if any) for this emerging clinical-stage biotech just yet. First off, Rigel is a tiny company with little experience in handling a regulatory filing. So, even if this second trial goes as planned, there's no guarantee the company will be able to navigate the regulatory review process in a timely and efficient manner. And that leads into the second problem facing Rigel's shareholders. Per its latest financial reports, the biotech's cash position in relation to its current burn rate would seem to necessitate a capital raise within the next year, and that's not even accounting for the additional costs associated with marketing a new drug. All told, Rigel comes across as a compelling watch list candidate right now based on fostamatinib's clinical progress and commercial potential. But the company still faces some critical hurdles that make it a tad too risky for my taste.